Leo Diamond presents a beautiful 1/2ct diamond in a classic solitaire design, loved by many for its timeless appeal and how it gracefully raises the diamond into prominence. The Leo Diamond is a product of four generations of expertise in the art of diamond cutting, resulting in the first diamond that was independently certified to be visibly brighter than other diamonds with 8 additional facets compared to traditional round brilliant cut diamonds. The band is made from platinum, rarer than gold and acknowledged for its stronger durability. An extra certificate is included in your purchase to verify its superior light performance. 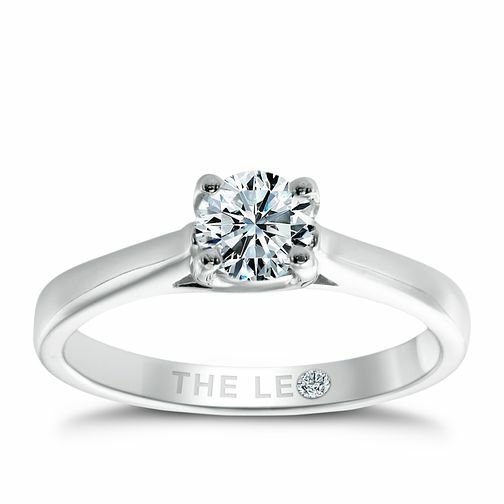 Leo Diamond platinum 1/2ct I-SI2 solitaire ring is rated 5.0 out of 5 by 5. Rated 5 out of 5 by Anonymous from Excellent quality beautiful diamond ring. Beautiful Diamond, set in a platinum ring.Worth every penny. Rated 5 out of 5 by Anonymous from It was meant to be! My husband recently took me shopping for a new wedding and engagement ring as I had an allergy to something in the White gold of my original rings. In store, this ring out shone all the others. I was instantly drawn to it, so had to try it on! It was a perfect fit and the sparkles amazing! My husband was very happy that it only took 20 minutes to find and purchase the ring. (He thought it would take all day!) It's a nice size diamond and looks impressive on the hand. I've ordered the Platinum 4mm super heavy wedding ring - I can't wait to see them on together! I highly recommend this ring, you won't be disappointed!